It was the first day of fourth grade when I told my dad I had decided to climb the highest peak on each of the seven continents: the Seven Summits. I was nine, and all summer long I’d been thinking about a mural on the wall of my elementary school, which laid out each of the Seven Summits and their elevations. I’d passed it every day on my way to and from recess, all through third grade. Other kids hardly seemed to notice it in their rush to play soccer or basketball, but I often stopped and stared, mesmerized by those mountains. What would it be like to stand on their summits and gaze across entire continents? I wanted to find out. One thing you should know about me: When I get interested in something, I become a fanatic and learn everything I can about it. When I was younger and got interested in reptiles, I learned everything there was to know about every species. Now my interest turned to mountains. I’ve always jumped into new interests with both feet, especially if they have to do with the outdoors. I’ve never been into playing video games or watching TV. Practically from the moment I could walk, I was outdoors—chasing lizards, riding my bike, skateboarding, and skiing. Especially skiing. That was my passion. But I couldn’t stop thinking about those mountains. 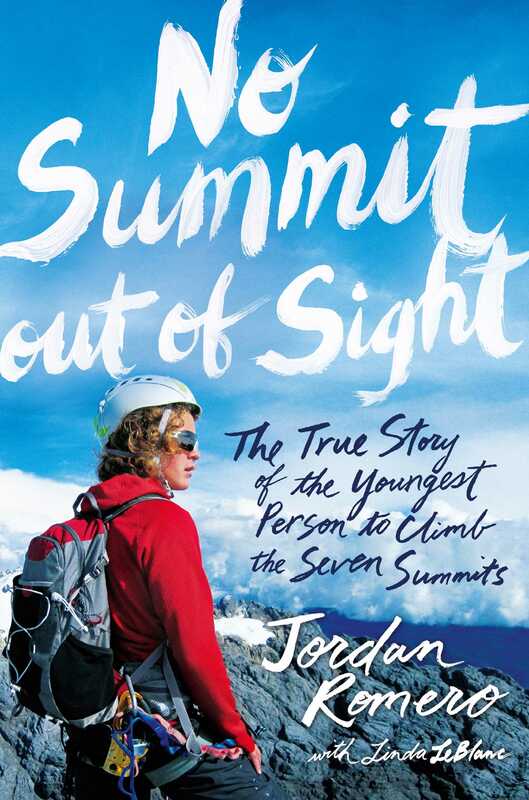 Over the summer between third and fourth grades, I did Internet searches to read about the summits. I made lists of their locations, their elevations, and the best routes to the top of each. Along the way I discovered that there were people who had made it a goal to climb all seven. I decided I could do that. I was the ultimate goal setter, so at that age I already understood that things didn’t always happen instantly. But that was okay. I was also extremely patient. And frankly, I didn’t think the idea would shock my dad that much. My dad and my stepmom, Karen, are professional athletes. They compete in extreme adventure races all over the world. It’s a crazy sport. They race nonstop on foot, on bicycles, in kayaks and canoes, and even on horses and camels. And they do it all in some of the most wild and remote places in the world. Our home has always been open to a never-ending stream of competitive athletes who are driven to enter the most brutal contests on the planet. Dad and Karen thought outside the box, set huge goals, and grabbed life with both hands. So why couldn’t I? Seeing that mural again on the first day of fourth grade help sharpen my resolve. My dad picked me up from school that day, and I sprang it on him. He was going on and on about this killer endurance event he and Karen were training for. They’d been preparing nonstop for weeks. They were always going, going, going. They believed you should live your life, not watch it. Their motto hung on the front of the house: GO FAST. TAKE CHANCES. He glanced at me. “Sort of, Little J,” he said, using his nickname for me. His jaw dropped, and he stared at me openmouthed for a minute. “Oookaaay,” he said. My dad has this way of stretching an “okay” out for a mile. This one went for two miles. I told him about the mural, and about how I had been looking at it for years and thinking about what it would be like to stand on top of each of those mountains and look at the world. “You really know about all this?” he asked. That was it, bang. I told him about all the stuff I’d learned—where and how high each summit was, what countries they were in, the best routes to the top of each summit. My dad has a huge smile, one that can light up a whole room. And nothing makes him happier than the idea of an athletic challenge. I watched his face closely, waiting for that smile. I guess I half expected him to say, Okay. Let’s buy tickets for every corner of the world and leave tomorrow. “I don’t care. I can do it,” I answered. Dad thought about it for a minute. He didn’t say yes, but he didn’t exactly say no, either.